Here's another thing you can do with Wolfram|Alpha when bored: Look up places on Earth that are diametrically opposite to you. Just key in 'my antipode' or just 'antipode'. For more fun, type in another place, for example 'los angeles antipode'. 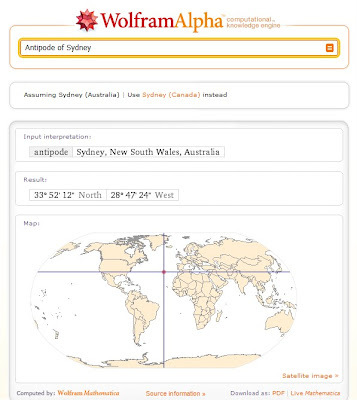 And Wolfram|Alpha will tell you what place is opposite to that place on Earth, and its co-ordinates. You can click the image below for a bigger version. Like this? You'll like to do one more thing. Subscribe to my blog! But hey! It's not hard. Show your appreciation by Liking it on Facebook (there's even an FB Like box up there) and following it on Twitter. You also have the option to use RSS too. Go to the subscribe page on the top of the page. Want more Wolfram|Alpha fun? See how you can mix up digital colours, create barcodes or compare traffic on websites you don't own. Don't want more Wolfram Alpha fun? See how to actually integrate Remember The Milk with Google Calendar or just go ahead and speed up your web browsing.